Remove the meat from the fridge approx. 1 hr. before cooking. Combine the coffee beans and espresso, coat the meat with the mixture. Heat the oil in a non-stick frying pan. Brown the meat all over for approx. 3 mins. over a medium heat. Remove the meat and set the pan aside. Combine the salt and egg whites in a bowl, place approx. 1/3 of the mixture on a baking tray lined with baking paper, spread to match the size of the meat. Place the meat on top, cover the meat completely and evenly with the remaining salt mixture, press down firmly. Approx. 20 mins. in the lower half of an oven preheated to 220°C. The core temperature of the meat should be approx. 48°C (see note). Remove and leave to rest for approx. 5 mins. Using a tablespoon, break apart and remove the salt crust. Remove the loose grains of salt from the meat with a brush. Place the stock and thyme in the frying pan, loosen any bits that have stuck to the bottom, bring to the boil. Reduce the heat, then remove the pan from the heat. Gradually add the butter, stirring with a whisk. Return the pan to the hob a few times to barely warm the sauce; it must not boil. Stir until the gravy becomes creamy, season with salt. 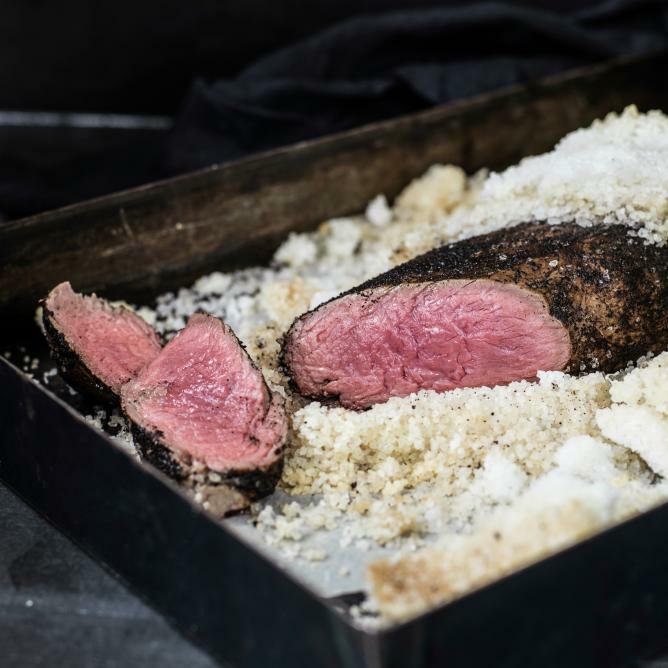 The meat will continue to cook in the salt crust so remove the fillet from the oven at a core temperature of 48°C.